Tuesday the 26th February, we had a chance to pop by Midsomer Norton. 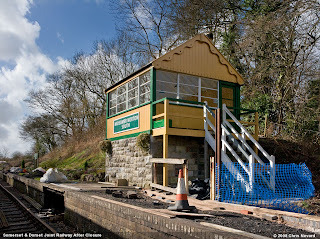 The Somerset & Dorset Railway Heritage Trust have been very busy putting on the finishing touches to the recreation of the famous signalbox. Since our last visit, the running in board on the up platform has appeared too, this looking very smart on the Southern Region Green it would have worn in the 1950's. Winding the clock back to around 1972, 6 years after the line closed, for what was thought for good. 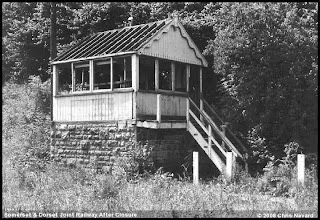 The B&W image here shows the original signal box shortly prior to demolition. Who'd have thought just over a generation later that S&D fan would be able to enjoy 'Midsomer Norton South' signal box again in all its glory, albeit a replica. Hopefully soon a Fowler 2-8-0 S&D 7F will soon be able stand next to this fine recreation of one of England's favourite signal boxes. ViTrains 37422 & 37403, again used as a test bed for the new baby camera. Here we are looking the other way to normal. 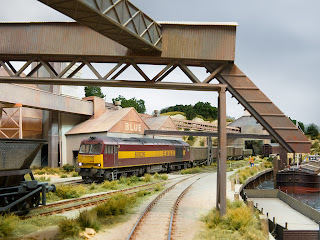 Another test shot with the little Canon G9; this time from a little further back, we see 60026 crawling along through the weed ridden tracks pulling a short rake of MEA wagons out from under the stone hopper on Cement Quay. This as before, was shot with the available mixed lighting and converted with Photoshop CS3's own raw convertor (Adobe RAW 4.3) rather than the supplied Canon software (which I haven't loaded). There is some slight barrel distortion visible with the overhead metalwork, not really any more than from any other camera of this type. Next time I'll use the Photoshop correction tools to remove this. Chromatic aberration is minimal, with just the slightest of fringing on high contrast edges at the periphery of the field. This was removed fully and very easily during the RAW conversion stage - good reason to use Adobe RAW over the Canon software which is unlikely to have that facility. Most of my magazine work is carried out with a digital SLR. Sometimes though, it is desirable to place the camera actually on the layout to get an unusual angle. This I normally achieve by resting the camera on a purpose made bean bag. This is all very well, space allowing. For tighter areas I've been looking at the possibilty of of using a smaller pocket sized camera. Drawbags until now with small cameras, have been limited manual settings, a lack of RAW for serious image capture, and a native file size that will be good enough quality for a double page spread. Canon's recently introduced G9 may well fit the bill, it having full manual controls that are not deeply embedded in clanky menu layers, a 4000x3000 (12MP) resolution, and the all important RAW capture. There is also the added bonus, mainly due to the tiny lens focal length and tiny sensor, that pictures taken on the G9 have an enormous depth of field - something we model photographers are always striving to achieve. Whilst my trustee Nikon D200 will still be used for the bulk of my work, the little all metal Canon G9 looks like it will be there in the camera bag for those awkward shots. The little camera also doubles up as a holiday and travel camera too! 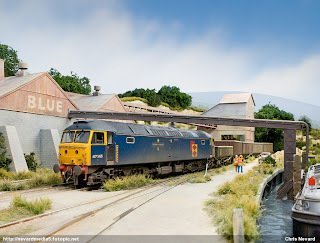 This above shot of 47145 captured on Cement Quay, was taken with the camera simply resting on the layout. The shutter was fired using the 'self timer' to avoid camera shake. I didn't use any additional lighting as would be the norm, the train here being simply illuminated with the layout's own flourescent lighting. The white balance was left in 'auto', with any final tweeks taking place during the RAW conversion stage using Adobe RAW 4.3/CS3. 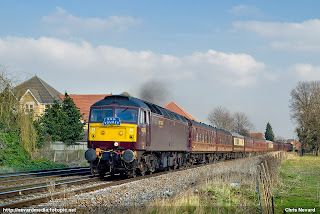 WCRC 47826 & 47804 power through the outskirts of Egham with the Doncaster to Portsmouth and return 'The Valentine Express' on Saturday 16 February 2008. 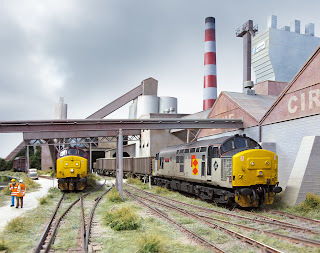 Recently I acquired a couple of the new ViTrains Class 37/4 to play about with. To make this one look a little more lifelike, it's had a dose of the airbrush and some extra details added.